Living LIGO: Advanced LIGO is Here! I've been away from all of you for a little over a year due to many factors including teaching new courses, starting new research projects, and more than a few personal reasons. 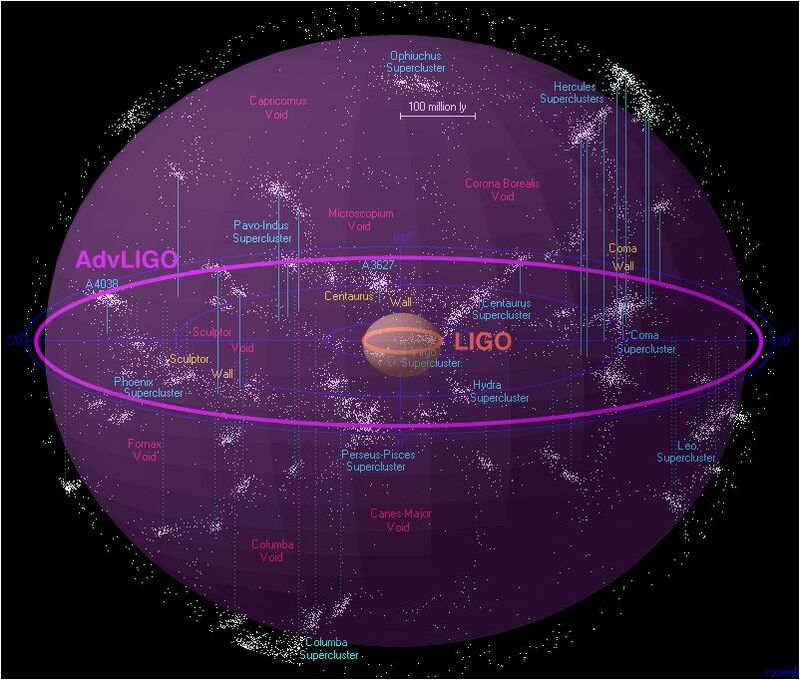 However, I wanted to let all of you know about the status of Advanced LIGO (spoiler: it's done) and that I will be back to posting on this blog on a regular basis. On 20 October 2010, Initial LIGO (iLIGO) recorded its last bits of science data [read the blog post here]. At that time, we were taking some of the most sensitive gravitational wave data and we thought we may have recorded a real gravitational wave (it was a fake signal purposefully placed in the data to test our ability to find real gravitational waves, but we didn't know that at the time [you can read all about it here]). The metaphorical "keys" to the detector were transferred from operations to the aLIGO installation team. In the nearly 5 years since iLIGO, we've removed all of the old instrumentation, much of which had been designed 15 years ago (remember what cell phones looked like back then? - we've come a long way) and replaced it with newly redesigned instruments. You won't notice anything different by flying over LIGO (there was not real estate expansion) but we gutted at very intricate and technical instrument and replaced it with more sophisticated hardware. The details on the upgrades could make a whole series of blog posts, but a few of them included improved seismic (ground vibration) isolation, better ways to hang our mirrors like pendula, a more powerful laser, more massive mirror, better coatings on the mirrors, and new ways to reuse laser light to increase the laser power in the the arms. All of this will combine to make aLIGO over 10 times as sensitive as it was before allowing us to observe 1000 times more of the universe than with the original observations we made. 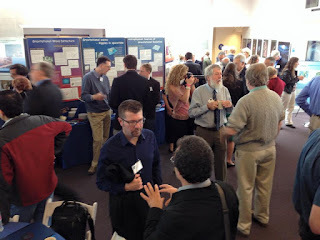 On 19 May 2015, aLIGO was dedicated at the Hanford, WA observatory (since I am at the Livingston, LA site and generally unimportant, I missed out). The "keys" are now back with the operations team at both sites (the Livingston site was scheduled to be 'done' before Hanford and has been 'working' for several months now). Why did I put done and working in quote in my parenthetical comment? 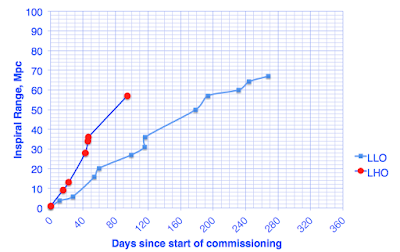 Well, now is the time for commissioning. The detector can turn on and operate as in interferometer but all of the new components aren't yet optimized to work together resulting in the detector being less sensitive than it was designed to be. The work that is currently gong in with the detector is commissioning work that seeks to work on individual subsystems so that the detector works better as a whole. In short, this is our version of tuning up our car. Even though neither detector is working at the sensitivity it was designed to, we are regularly setting sensitivity records when we do turn on the detector to test the commissioning work. One of the ways we measure our sensitivity is to determine the farthest distance away a standard source of gravitational waves could be for us to just be able to detect it. The standard source we use is two neutron stars orbiting each other and merging into one. (We picked this because it is a simple system were we can predict how big the gravitational waves will be and what shape the waves will have.) We call this the inspiral range. 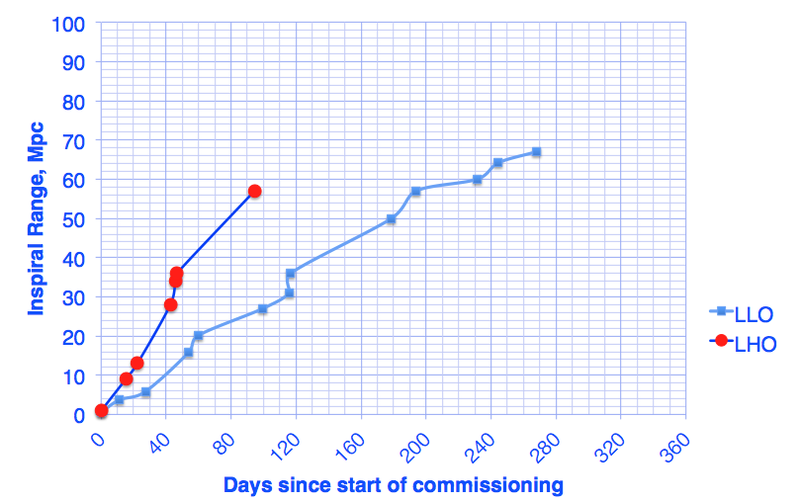 Below is the insprial range for each aLIGO detector (Livingston is the blue squares line and Hanford is the red dots line) given the number of days since the aLIGO installation was declared complete (there are more data points for Livingston since we were scheduled to be done a little before Hanford). Our best data with iLIGO was able to detect out to about 20 Mpc (a little over 65 million light years away). Currently, the Livingston's inspiral range is at 65 Mpc (212 million light years) and Hanford's is at 57 Mpc (almost 186 million light years). So, even though we are still commissioning the detectors, we are already gathering the most sensitive gravitational-wave data ever! I lost a very good friend a few moths ago. Cristina and I were both postdocs at LIGO Livingston until 2012 when she took a position at the University of Texas at Brownsville as a professor. We shared a passion for engaging others in our science, but she always had an openness to others that I have admired. She was a better friend to me than I ever was to her, but if she was here to read this she would argue with me since she did exactly that in one of our last emails. The last time I saw her in person was when I was at UT Brownsville earlier this year to speak about work/life balance, which I don't really have figured out, at a regional Conference for Undergraduate Women in Physics (there is a beautiful tribute to her at the bottom of this page). She was so stressed since much of the local organization and logistics was on her shoulders but the meeting went very well! If I had any idea that I wouldn't be seeing her again, I would have made more of an effort to spend time with her (instead of just trying to stay out of her hair). 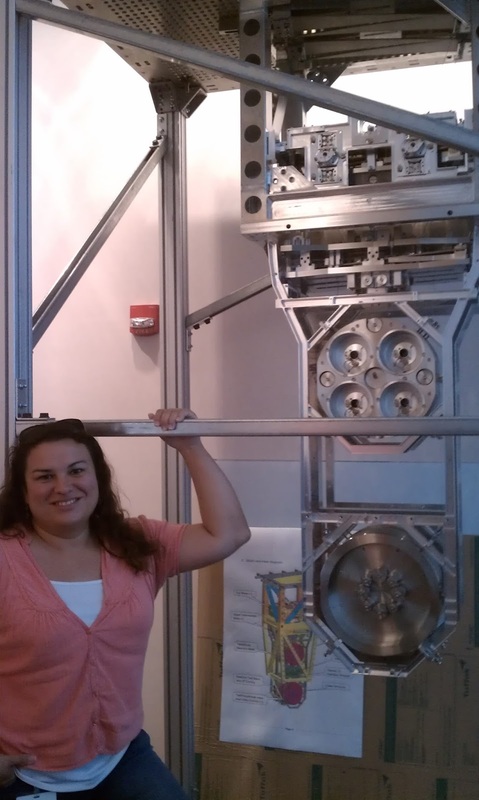 This is a picture of Cristina with a prototype of the new mirror suspension system at LIGO Livingston in 2012. We use this display to show visitors some of the upgrades that they aren't able to see inside of aLIGO.